If you're seeking privacy and seclusion, this mountain retreat is the one for you! Located about three-quarters of a mile up the Logan Mountain slope, you will find quiet solitude with a great view of the Absaroka Mountain range. Elk and mule deer are hunted in season around this forty-acre compound and the adjoining federal lands.Guests with horses return year after year to enjoy riding the 100's of miles of trails in the immediate area. 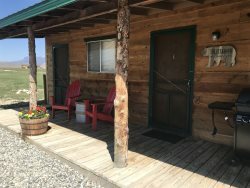 Guests also rest assured their animals are left in a safe and secure environment while they enjoy activities and entertainment in the town of Cody. At Lazy J Basin, nineteenth century privacy meets twenty-first century amenities and comfort! Loved the secluded location, but it is close enough to drive into Cody and it is along the way to Yellowstone East gate. Cabin has everything you need, and the decor was beautiful. We wished we could have stayed longer. Sandi's the greatest. She was prompt in her responses and so kind. We LOVED the cabin and the property! Only downside was the mouse in the bedroom by the kitchen on the main level. It freaked our daughter out and she didn't want to sleep in there. Very little contact everything went smooth. Great vacation experience. Loved the place. Fantastic views great hiking. Beautiful property and surrounding area! Would love to come back and would recommend to anyone! All our dealings were via emails, which were handled promptly and professionally. Lazy J is ideal for 2-4 adults. The view is spectacular and the location is ideal for visiting the entire area. We left our iPad in the rental they found it for us and sent it to our home right away. The customer service rep was very helpful and kind. We enjoyed every second we were there it was beautiful and so comfortable. This had to be the easiest cabin rental experience we have had. Loved this cabin, would recommend to anyone. Beautiful cabin, just gorgeous and breathtaking views. Quiet, peaceful and secluded! It was an excellent property. Located at very picturesque location, amid the hills. Well maintained and clean. Everyone was quick to reply via email and gave us great information for check-in and check-out procedures. They even called us to let us know my husband left his shoes there, and mailed them to us. Our family had an incredible time staying at the Lazy J Basin! It was the perfect size for our family of 4, and a great place to unwind during our long travels. The views from the cabin were beautiful, and the hiking and exploring was so fun for our children. If we travel through Wyoming again we would definitely stay at the Lazy J and will be recommending it to all our friends and family who travel through Wyoming. Thanks for a wonderful experience!! They were very pleasant and we appreciated how quickly they responded to any question! The stay was amazing, the only problem was that we couldn't stay longer. We loved the views from the living room, the front porch, basically anywhere on the property. It was nice to be able to hike right there and to truly enjoy the absence of the city/ traffic/ other people in general without feeling like you were stuck. It was beautiful, inside and out! Very professional and answered all of our questions. What a great spot, good location close to the east gate of Yellowstone and Cody. Great service and quick response. Agent did a great job with the reservation process and was great to work with during our stay. Beautiful view. Nice property. A few small things that could make it better, but overall an enjoyable stay.